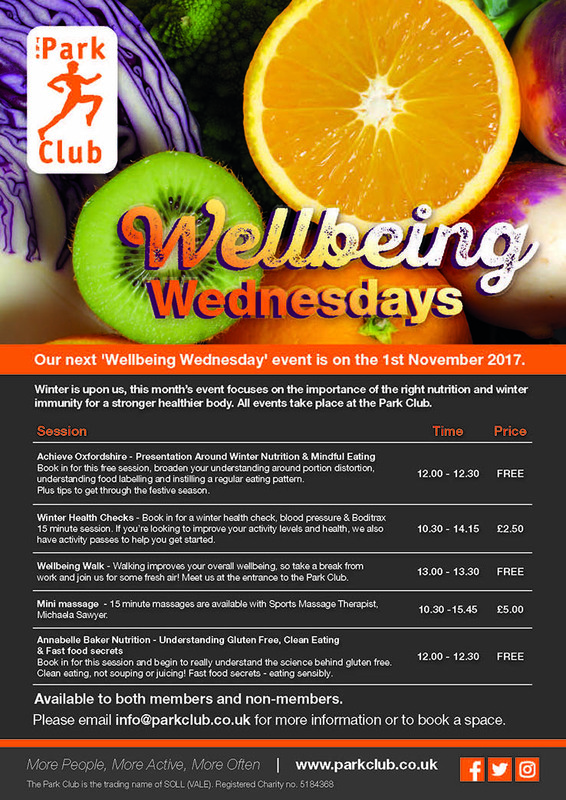 Our next 'Wellbeing Wednesday' event is on the 1st November 2017. Winter is upon us, so this month’s event focuses on the importance of the right nutrition and winter immunity for a stronger, healthier body. Achieve Oxfordshire - Presentation Around Winter Nutrition & Mindful Eating, broaden your understanding around portion distortion, understanding food labelling and instilling a regular eating pattern. Plus tips to get through the festive season. Annabelle Baker Nutrition - Understanding Gluten Free, Clean Eating & Fast food secrets. Book in for this session and begin to really understand the science behind gluten free. Clean eating, not souping or juicing! Fast food secrets - eating sensibly. Wellbeing Walk - Walking improves your overall wellbeing, so take a break from work and join us for some fresh air! Meet us at the entrance to the Park Club to get started. Mini massage - 15 minute massages are available with Sports Massage Therapist, Michaela Sawyer. Winter Health Checks - Book in for a winter health check, blood pressure & Boditrax. 15 minute session. For more information or to book your place email info@parkclub.co.uk or call 01235 206777. To share this with your colleagues please download this poster.